Among the many fine guitar-cleaning products available at your local music store, a good polish and some lint-free polishing rags are must-have items. After playing your guitar, wipe the strings with a dry cloth. Use guitar polish sparingly on the rest of the instrument. On satin finishes, the wood will take on an attractive patina over time. Again, use polish sparingly or simply use a clean, slightly damp cloth to wipe down the surface, following it up soon after with a clean, dry cloth to ensure that no moisture remains. Use lemon oil or a specially formulated fingerboard conditioner on the fingerboard and bridge a couple of times a year or when the wood looks dry (you must remove the strings to do this). Replace old, dull or discolored strings. Do not remove all the strings at once. Rather, change strings one at a time, as this puts less stress on the truss rod (click here for instructions on adjusting Takamine’s two-way truss rod). Generally, your guitar is comfortable under the same temperature and humidity conditions in which you are comfortable. Moderate temperatures and a 40- to 60-percent humidity level are optimal for your guitar. Use a case or room humidifier if you’re in mountains or desert and run heating or air conditioning frequently (or if you’re unsure of conditions). You won’t need a humidifier if you live near larger bodies of water or on a boat; a desiccant (silicon pack) might be necessary in these conditions. Do not “shock” your guitar by subjecting it to environmental extremes. 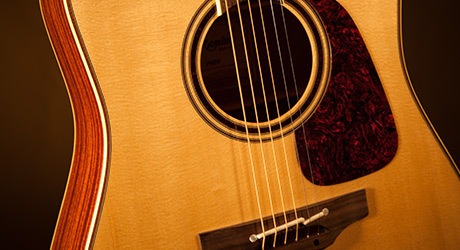 For example, if it’s winter and your guitar is in the car for a while in snowy conditions, don’t open the case as soon as you enter a warmer environment such as a home or a club or another venue; leave it in its case with the lid closed for a period sufficient to let the instrument come up to room temperature. For several good reasons, in fact, do not leave your guitar in the trunk of your car, or even just locked up in a vehicle’s interior. A good case is invaluable. When you put a guitar in its case and close the lid, make sure the latches are properly engaged. Carry the case with the lid facing toward you. If you’re unfamiliar with making truss rod adjustments yourself, let someone who is familiar with them—such as a qualified repair professional or experienced guitar tech—do it for you. Don’t tune your guitar above pitch. Tune to proper pitch. A wide variety of reliable and inexpensive electronic tuners are available. Be especially careful when flying with your guitar. Loosen the strings by a whole step or so and put it in the sturdiest and best-fitting guitar case you can find. Playing your guitar makes you feel great—and also makes your guitar feel great. Playing your guitar actually helps the wood it’s made of develop tone. And the more you play your guitar, the more you’ll develop a feel for it and be able to recognize when maintenance is needed. And it will eventually require maintenance. Guitars are machines with adjustable parts, and, like all machines, are subject to the vagaries of use, abuse and environmental conditions. Your guitar will occasionally require service or repair, such as a setup, fret dressing or a truss rod adjustment. There are several minor routine maintenance procedures that many guitarists are comfortable performing themselves and for which instruction is readily available; others prefer to leave such work to qualified professionals. Either way, a well-maintained guitar will reward you with years of enjoyment.